08.Jun.08 - On June 5-6, activists from many different countries came to Warsaw to protest against the deadly policies of Frontex, the EU agency which conducts migrant hunting operations, trains border guards and special units to hunt down people crossing so-called "national borders" and which helps to coordinate and implement EU immigration policy. 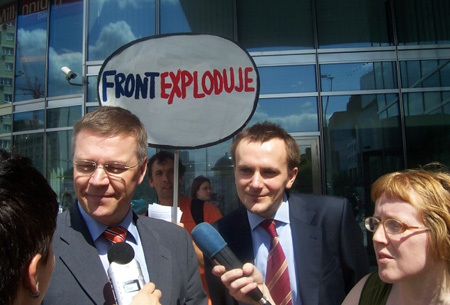 Frontex has its headquarters in Warsaw. On June 5, the second of two transnational conferences took place. (A more complete account of the conference should appear later.) The conference was opened by Laure Akai with presentations by Amadou Mbow, a human rights activist from Mauretania, Devi Sachetti from Italy, who deals with issues of migrant rights, including the issue of precarity and migrant labour, Vincent de Jong from Holland, who is active in resistance against detention and deportation in Holland, Georgios Maniatis from Greece and Hagen Kopp from Germany. The speakers presented information about the Frontex operations near the coast of Africa and their consequences, the operations in Libya and the Mediterraen and Agean Seas as well as an overview of Frontex operations, the ideology behind this and our arguments against this regime. It was pointed out during the presentations and later discussions how destructive these policies are and how the migrants can be victimized twice - for example, by the practices of some businesses which undermine their traditional livelihoods at home and then by the policies of the countries these businesses tend to come from, which seek to exclude people. 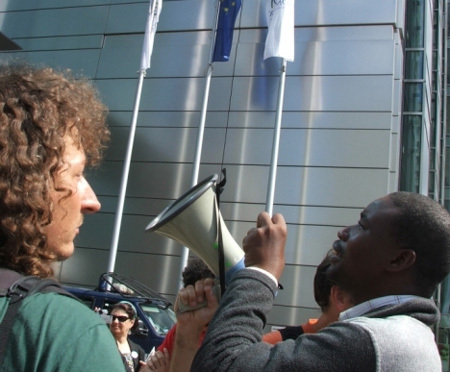 On June 6, a demonstration was held in front of Frontex headquarters. People from many countries were present, people from various social movements, some refugees living in Poland as well. 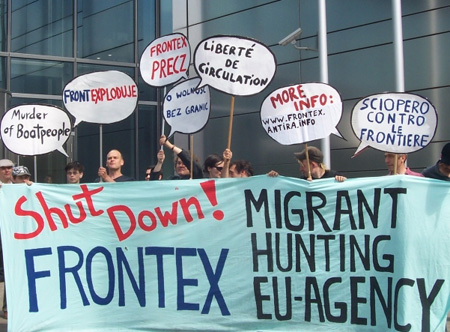 The protestors demand that Frontex be shut down and that freedom of movement should be given to all, that there be an end to descrimination of all sorts against immigrants. The sleazy head of Frontex, Ilkka Laitinen, came out to try to assure the press that he's a nice, decent guy who's just doing his job, which most people agree with. He invited some people in to speak with him but, just like any two-faced, teflon politician, he tried to deflect all criticism by using Eichmann's defense and pretended to not know anything about migrants suffering because of Frontex's work. He asked people to please inform people should they hear of any problems. As if the fact that people came thousands of miles to protest was no indication that something was going wrong. The protestors made some speeches and had many slogans against borders in general, against deportation, against Frontex, etc. Afterwards, a demonstration was held. People went to the Presidential Palace to protest Poland's immigration policies, in particular it's agreement with the Vietnamese government to deport 5000 Vietnamese people. The Polish border police, along with Vietnamese security forces, carried out a number of raids recently in which Vietnamese people were beaten, detained and deported. This government agreement has driven many of Poland's Vietnamese (70,000 people in Warsaw) underground. Afterwards activists met and agreed to continue working on this issue, to make the issue more known and to provide a deeper analysis of the processes, including appeals to working class people not to be fooled by the divisive ideology of the statists and capitalists which pits working people against each other. 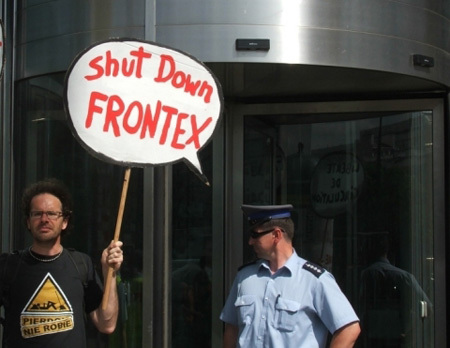 The anti-Frontex activities was ended by a concert on June 7th.